And Program 3 has officially begun! Our stimulating subject courses kicked off today, as students met their expert teachers for the first time. 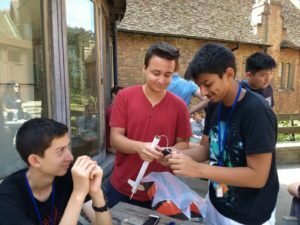 Although all classes proved to be super exciting for our new students, the Physics & Astronomy class beat them all, as students had the opportunity to put their freshly gained knowledge immediately into practice, and spent the day constructing rockets! The afternoon brought it with some free time, it was the first occasion that the students had to explore Cambridge on their own. They also had the opportunity to grab some lunch in one of the many wonderful, student-friendly places in this city. It was then time for the first leisurely activity of the Program– our classic Instravaganza! Students were divided into teams led by our supervisor team in their brightest orange t-shirts, their task was to complete a scavenger hunt involving Cambridge landmarks, all the while taking creative pictures of themselves. Check them out using the hashtag #ReachCambridge2018. The Instravaganza ended with the ultimate photo, the official Reach Cambridge Program 3 photo. The photo will be available to purchase, and act as the ultimate souvenir for our students who will grow to know each other very well over the next two weeks. After some very tasty dinner at their respective colleges, the students were greeted by a cool evening breeze as they Cawalked over to the Engineering department for their first lecture on the subject of Music composition. Andrew Simmons challenged the students to create a new soundtrack for an old Lucozade advert and the final product was definitely something that the students were proud of.